The Mojave rattlesnake (Crotalus scutulatus) is the most venomous rattlesnake in North America, and therefore extremely dangerous. As the name implies, the snake originates from the Mojave Desert of California. It’s also found in Arizona, Utah, southern Nevada, western Texas, New Mexico and southern Mexico. Although rattlesnakes generally don’t attack unless defending themselves, the Mojave rattlesnake can be highly irritable and unpredictable. An adult Mojave rattlesnake averages between 3 and 4 feet, although some might reach 5 feet in length. 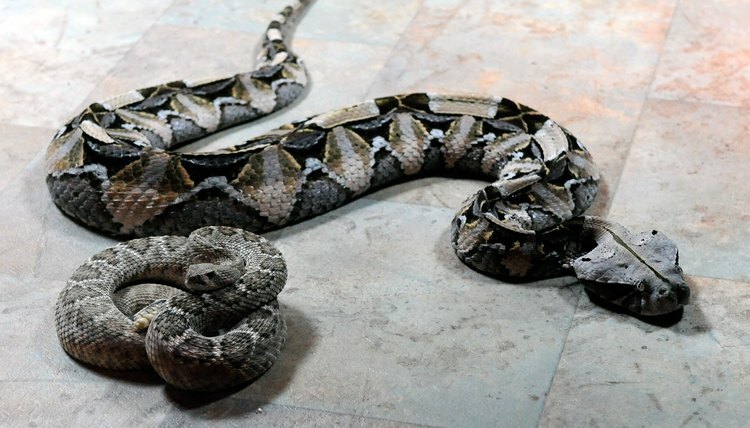 The snake has a heavy body, a large triangular head and a thin neck. Its body is typically grey, tan, brown, olive-green or light yellow, with a diamond pattern on its dorsal side. The pattern fades into white rings, contrasted with narrower black rings near the end of the tail, which has a rattle of loose, interlocking segments. Its eyes are elliptical, resembling a cat. The snake has a light, cream-colored stripe on both sides of its head, which begin at the eye and run diagonally above the corner of the mouth. It has heat-sensing pits on its head, between the eye and nostril, enabling it to find its prey in the dark. Its fangs are long, hollow, movable, connected to the venom glands and replaced when broken. The potentially fatal venom of the Mojave rattlesnake is 10 times more toxic than any other rattlesnake in North America. Although the snake’s bite is generally less painful than other rattlesnake bites, its venom acts as a neurotoxin, because it attacks the nervous system, infects the bloodstream with hemotoxins and causes the most severe respiratory distress. These combining factors have resulted in the snake’s venom being given the name “Mojave toxin.” There are two types of venom among the Mojave rattlesnake. Those with the Mojave toxin have venom Type A and are found in all designated areas. Those without the Mojave toxin are referred to as having venom Type B, which is a hemorrhagic toxin, meaning it causes its victim to bleed profusely. Type A toxin is 30 to 40 times more toxic than Type B. Type B venom snakes are found only within central Arizona. Mojave rattlesnakes that have both venom types are found throughout Arizona. The snake is predominantly nocturnal during the summer when daytime heat is highest, and burrows in crevices or hides under rocks. However, it might become active during daylight when temperatures are moderate. It hibernates alone or with one or two other snakes in the winter. When frightened or agitated, it shakes its tail, producing a buzzing sound to alert the intruder before striking. The Mojave rattlesnake gives live birth to several young, which are 9 to 11 inches long and have only a silent button at the end of their tails. The Mojave rattlesnake prefers bushes and grasslands within low mountain slopes and dry areas in the high desert. It’s typically found in mesquite, juniper, chaparral and creosote brush or among the rocks in the desert hills. The diet of Mojave rattlesnakes primarily consists of small mammals, such as mice, rats and rabbits. Research by the University of Texas at El Paso supports the belief that the kangaroo rat is the most prevalent prey of choice. Other, less commonly eaten mammals include lizards, toads and other snakes. The snake hunts while on the move or by ambushing its prey while resting, and swallows its victims whole.